Optical Sorter Market size valued at over USD 1.5 billion in 2017 and will grow at a CAGR of around 9% from 2018 to 2024. Growing need to reduce the process and delivery time and stringent government regulations in the food industry are expected to drive the optical sorter market over the coming years. Several food safety systems, legislation, and controls are being developed for controlling the microbiological and chemical hazards to reduce the risks to consumers’ health. Several government regulatory bodies are establishing a food safety strategy that will help in the traceability of food items at several stages including processing, production, and distribution. This is helping the companies involved in the production of food products to implement the control and monitoring unit for the management of the food ingredient quality. The technology when implemented will allow the food manufacturers to enhance the productivity of the business operation and separate the inferior-quality materials. The optical sorter recycling technology helps in automatically identifying and sorting most recyclables thereby offering clean commodity recovery, increasing throughput, and reducing labor costs. Rising awareness about the recovery of the industrial waste to ensure high productivity and environmental safety is driving adoption of the technology in waste recycling plants. Several industries are engaged in collecting, managing, and processing their industrial wastes to gain the maximum usage of the material and the resources. Companies are establishing separate recycling plants where the process of recovering the hazardous materials and elements is being witnessed, owing to which manufacturers are developing advanced solutions to provide effective and reliable technologies for supporting the recycling operations. These factors are anticipated to positively impact the optical sorter market growth over the forecast timespan. Hyperspectral cameras are expected to grow at 12% CAGR over the forecast timespan. In the optical sorter market, they are being widely used and implemented owing to the growing need to solve previously impossible sorting tasks. Companies are developing a new generation of systems that feature hyperspectral and multispectral imaging systems. Hyperspectral cameras are similar to the trichromatic cameras and they collect data from the electromagnetic spectrum. They are increasingly being applied for quality control, sorting, and recycling applications. In the food industry, the sorting technology has numerous applications owing to the growing need for the inspection of the properties of food. Capturing images of the products may not offer enough data for a system to classify or inspect food products owing to which several manufacturers are now implementing multispectral imaging systems, thereby driving the demand for hyperspectral cameras in the optical sorter market. Belt sorting machinery is witnessing a significant demand from recycling, mining, and food industries. The equipment has high-performance abilities for dried/frozen/fresh vegetables and fruits, nuts, and processed potato products. Moreover, it helps in identifying small defects and foreign materials thereby enhancing the accuracy of the ejection system and helping in defect removal performance and maximizing the sorter's yield. The industry has observed increased applicability of these platforms as they offer high accuracy and low carryover ratio. They are widely used in high-capacity operations and help in minimizing the risk of food contamination thereby resulting in an enhanced product quality. The platform is also widely used for recycling applications of organic waste, glass, metals, e-scrape, plastics, and papers, among others. In the optical sorter market, belt platforms have witnessed a high demand among its end users owing to the rising labor costs and increasing global population. In 2017, the mining industry accounted for over 15% of the overall optical sorter market share. Growing applications of the machinery in the mining industry for mineral and metal separation processes are being witnessed. Sensor-based sorting solutions increase the overall value of the deposit and extend the life of mining operations. Modern automated sorting uses NIR sorters and hyperspectral cameras to control the mechanical separation of ore into two or more categories. Technological advancements and innovations in the mineral sorting processes by NIR detection technology allow the successful separation of the minerals. These use infrared imaging technology to scan the chemical and biological structure of the mineral and offers high reliability and accuracy in mineral sorting processes. Several players operating in the optical sorter market are offering advanced and innovative solutions for performing the mineral sortation process. In 2017, Asia Pacific accounted for around 20% of the optical sorter market share and is witnessing a substantial growth owing to the growing adoption of intelligent solutions and rapid growth in digitalization. The integration of AI technology into the equipment is providing companies features such as advanced analytics, monitoring, and automation of the processes. Manufacturers are involved in developing the AI-based sorting technology to provide effective & intelligent solutions for the industrial operations and processes. For instance, in September 2018, National Recovery Technologies integrated Max-AI technology into its NRT SpydIR optical sorter. This integration is expected to improve the material quality and thereby enhancing the productivity. 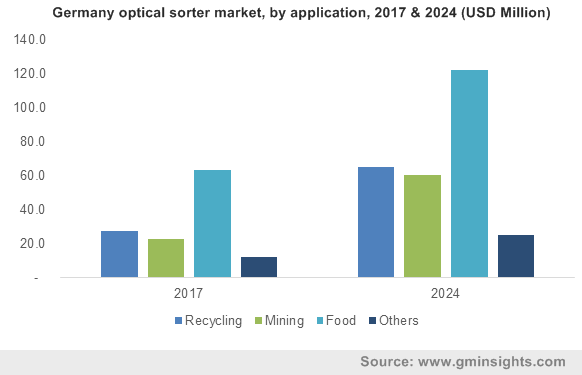 Such advanced solutions are encouraging the industrial players to adopt smart solutions in their food production & waste recycling plants, thereby driving the optical sorter market demand. 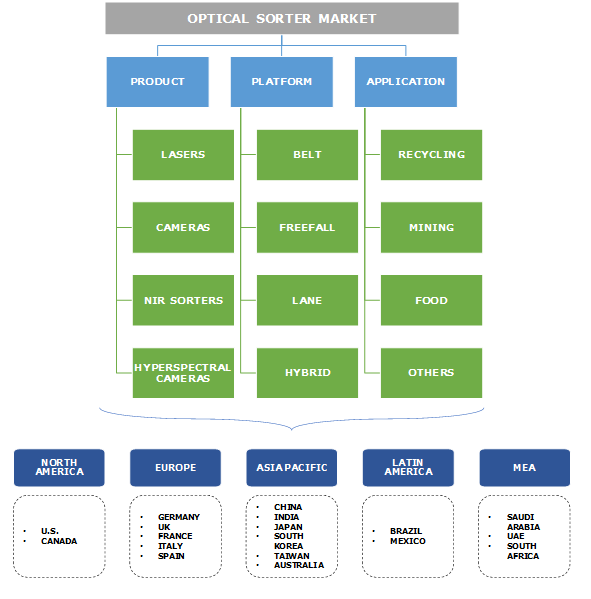 Key players operating in the optical sorter market include Allgaier Werke GmbH, Binder + Co AG, Buhler AG, A/S Cimbria, CP Manufacturing, Inc., Greefa Italia GmbH, Key Technology, Inc., National Recovery Technologies LLC, Newtec A/S, Pellenc ST, Raytec Vision SpA., Satake Corporation, Sesotec GmbH, Steinert GmbH, and Tomra Systems ASA, among others. These companies are engaged in designing, manufacturing, and distribution of material recovery, and sorting solutions. They are offering these products and solutions for food, recycling, and mining industries. Suppliers in the optical sorter market are entering into long-term partnerships and contracts with several industrial players to offer advanced sorting solutions. Moreover, these players are developing innovative solutions to help the food manufacturers improve their productivity and quality. The companies operating in the optical sorter market are continuously investing in the research and development for product innovations, particularly in software developments. They are entering into strategic partnerships with regional players to expand their presence in untapped markets. For instance, Pellenc ST and Sesotec GmbH have entered into a new partnership to complement their individual product portfolios and market. This partnership will allow companies to distribute their metal scrap sorting equipment in France and Japan and plastics recycling equipment in the UK, Japan, and France. Moreover, with the advent of IoT, the optical sorter market is witnessing a rise in the adoption of digitized and technically-advanced products & systems.